Photographer Neil Beaty brings his captivating images to numerous magazines and publications and needed a true online portfolio for his work in a gallery-format. He presents sharp, innovative photography both for commercial use and for framed art. He needed a structure in which he could display his photos in differing subjects, mediums, and genres. 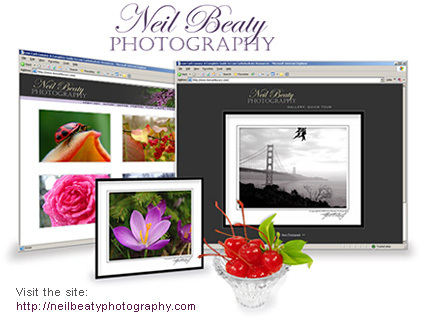 Neil has found his talent netting him product photography, nature layouts, and gallery showings. His work has won him praise from both the real world and the online community. Whether shooting the mouthwatering goodness of an elegant dessert, or the serenity of a sunlit lake, Neil strikes the right balance of color, form, and clarity, and his website needed to do the same. We opted to offer the visitor a choice when entering the site — either take a quick "tour" of his framed works, or sift through the gallery by subject matter, with all photos clickable to a larger format. We added a storefront as well, so that visitors wishing to purchase pre-framed and matted works could do so easily.